Long time since, I wrote off to Scottish zine Dumb/Sulk Trigg-er for a 7" single called So Far So Spitfire by Dawn of the Replicants. It came. It sounded like it was recorded by a band made up of werewolves and the more drug-friendly Beach Boys in a thick, thick fog. I liked it. 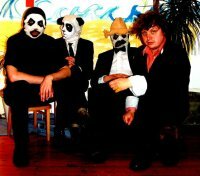 I reviewed it for Splendid: "they're purveyors of noisy, distortion-enhanced, unhinged slightly-pop songs." The band signed to East West. They made like Guided By Voices and put out a million songs a week. They released an album. It came. I reviewed it in Robots: "There's something intrinsically strange and twisted about DotR ... Paul Vickers uses hallucinogens and a satanic thesaurus to conjour up some Dadaist lyrical mismatchery then wanders out to the cages at the end of his garden in which the rest of the band live, cramped wooden cubes filled with broken instruments and 4-track recorders with missing knobs. He gives each of them a sheet of lyrics, pours a little water into their bowls, switches tapes between all the recorders and promises food the following day ... if they're good." Ten years and a hundred records later and Dawn of the Replicants went quiet. 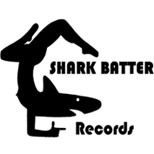 Another couple of years later and we find Roger Simian (one of the caged band) running the Shark Batter label while Vickers is working with The Leg. Shark Batter bands: Vacuum Spasm Babies are a less insular more open-minded JAMC. Kono Michi makes sinuous extra-terrestrial trip hop like Pop Off Tuesday used to. The Stark Palace would like to be Tom Waits' voodoo garage backing band. Paul Vickers and The Leg sound like cavemen banging musical instruments against a rock. The album Tropical Favourites is released by SL. Tell us about Shark Batter. Roger: We're a DIY label based in the Scottish Borders with an offshoot in New York. Our main aim at the moment is to help get wider exposure for our own bands and for a few others we really like. We do our own plugging (free land-line calls are essential for this) and it's going very well so far. R: That came from the warped brain of my brother, Stoneghost Mike. His original vision had a hammerhead but that was deemed just a little too disturbing. Paul, what's with the pandas? Paul: When Alun Leg was young he had a chum called Leo that always wanted to play pandas and tigers in the playground but he would not let any one apart from himself be a panda. The tigers would have to buy food for the panda as he would sit crossed leged in a hideaway. Alun always wanted to be like Leo and sit in the hut eating sweets and now he can have his cake and ate it by playing music and eating sweets dressed as a panda. Why do your own solo thing? P: Well its me and The Leg so its not really a solo thing. Its been a lot of fun, which is a good reason, apart from a gig in Prestonpans during which we made a curry backstasge for 150 people but only 7 turned up so most of it was binned. Then had to play with no p.a and just make stuff up on an out of tune piano. Dan gave up all hope and started morris dancing then ran out on to the road and nearly ended up under a bus. Why do your own label? R: If we'd had immediate access to a label who wanted to release our own bands immediately we might not've done this. But we liked the idea of working together and utilising the different talents each of us have. We have a lot of enthusiasm for this and it gives us something to bicker, plan and yabber about when we meet up for coffees at the local Tesco. We like that we can release things pretty much as soon as the recording is done and somebody's knocked together some sleeve artwork. It's 29th July as I'm writing this and we've already released 5 EPs and a single this year. You're not expecting to make any money? R: Money can't buy you love, Jimmy Possession. You're not even expecting to break even? R: As song-writers we earn royalties every time our songs are played on the BBC (through the PRS - Performing Rights Society). Every release so far on the label this year has received airplay. As a label we've also just joined another organisation, PPL, who distribute royalties to musicians. 50% will go to the label and 50% will be shared amongst each of the performers. Not sure how many download sales there have been but hopefully small amounts will trickle in from there. Because our costs are low on each EP - around £100 to cover manufacturing promo CDrs, home-made sleeves and postage - it's not unfeasible that we could break even at some point the way we're doing it just now. Ideally we'll be able to move things up a level to where we can actually be manufacturing CDs for sale through a distributor, rather than just being a downloads-only label. Paul, If you started a label like Roger has, what bands would you put on it? P: I would have to find bands and it would take time. Roger, where did you find the bands? R: The Stark Palace and The Stone Ghost Collective are our own bands. Vacuum Spasm Babies are our friends. Stoneghost Mike met Kono Michi through MySpace a few years ago. They bonded over a liking for classical music and the Cocteau Twins. Is there a label ethos? R: Nothing we've thought through in great detail or verbalised. We don't have a manifesto. I think the label reflects the personalities and interests of the five individuals involved in running it: me, my brother Stoneghost Mike, Brendan McAndrew, Cameron Jack and Michi Wiancko (in Brooklyn). Is there a Leg ethos? R: Dawn Of The Replicants is in hibernation. We meet up with Paul regularly and have a bunch of songs written that we've not got round to recording yet (plus a few, actually recorded). So there will be more DOTR releases - we just don't know yet when or how they'll work. P: Nothing right now. Everyone's off doing their own thing. I still have the white label So Far So Spitfire ep. Is it worth anything these days? R: I'm sure Paul told me a few years ago that Record Collector had priced it at £15. (Or that might've been the white label David Holmes / Tim Goldsworthy remix of "Skullcrusher".) Does yours have "Dawn Of" stencilled onto it? We were originally called The Replicants and got the disks pressed up before we discovered there was at least one other band with that name. So I had to stencil 'em by hand - haha. "Dawn Of The Replicants" was the name of a weird instrumental on one of our early demo tapes, I seem to recall. I wonder which disks would be more collectible: those that involved some craft work from the band or the rarer ones that are untampered with? P: I dont know, but hold onto it you never know - you may get £3.99. Have you learnt anything (positive or negative) from DOTR that you will/won't do with your own label/bands? R: We don't really analyse things in that way but the history of DOTR and our earlier work together running the music magazine, Sun Zoom Spark, has definitely seeped into us, its formed us, made us into whatever we are now. I'm sure that the good and the bad experiences have left their marks on our synapses and every decision we make is laced with hints of our own pasts. But we don't think about it consciously. We treat the bands how we'd want to be treated. Also - because we release stuff by our own bands too we probably come across more like label-mates than record execs. P: Never write songs when you're really low or really happy. Trying to work with a fuzzy head hung over is good, or a little high.